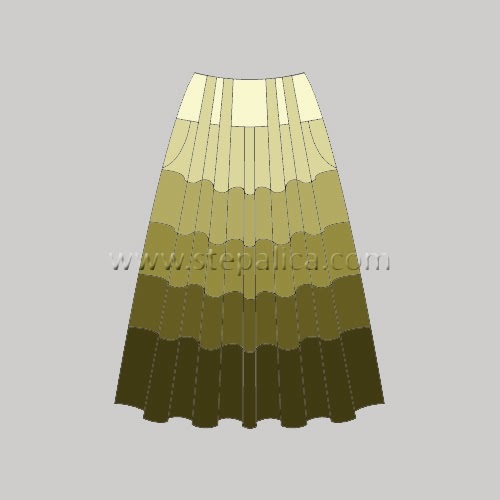 Zlata skirt pattern has five box pleats on both front and back panels, that give it a nice volume. 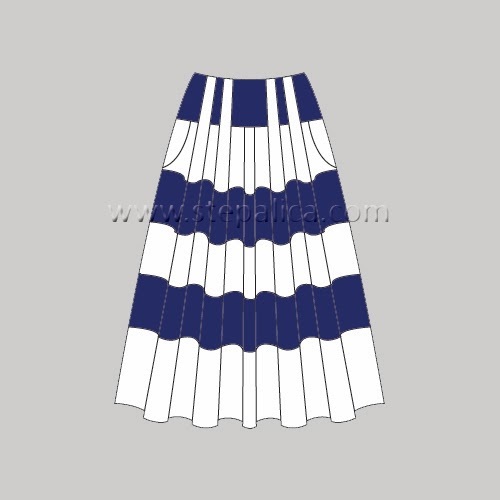 It is essential to pick the right kind of fabric for this skirt, the fabric that will hold the structure of the pleats and give your skirt some body. 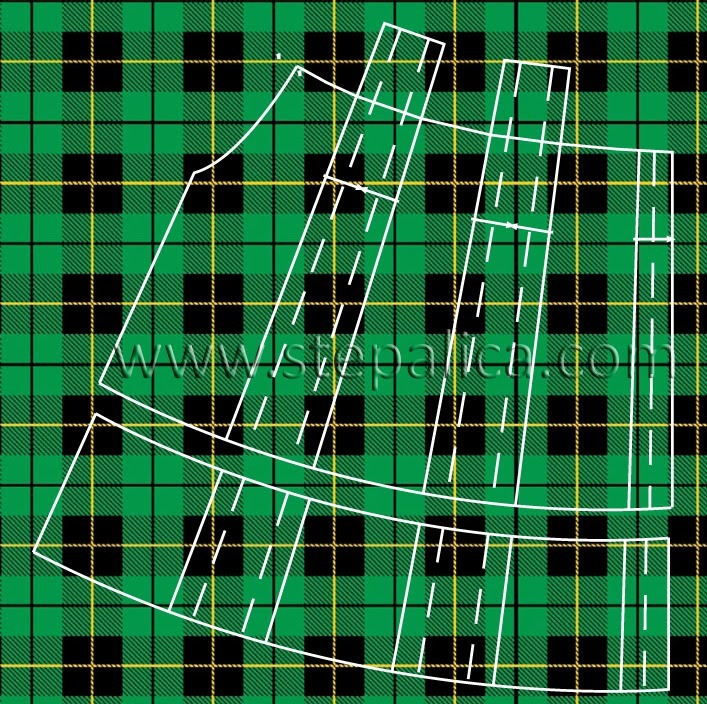 Also, it's important to choose a fabric that will feature the best on the skirt, once it's sewed. Zlata skirt requires a firm fabric that doesn't drape too much, which has some structure to it and that is woven not knitted. When selecting fabrics for your Zlata skirt think of the following fabrics: stiff cotton, twill, denim, corduroy linen, shantung silk, taffeta, tweed, suiting, and similar fabrics. Avoid light and drapey fabrics. Zlata skirt pattern is suitable for both plain and printed fabrics, it's also a great pattern for color blocking and print blocking. If you're thinking of making the skirt in printed fabric, my recommendation is to choose those with floral, paisley or abstract prints, with no defined shapes that need to be matched. 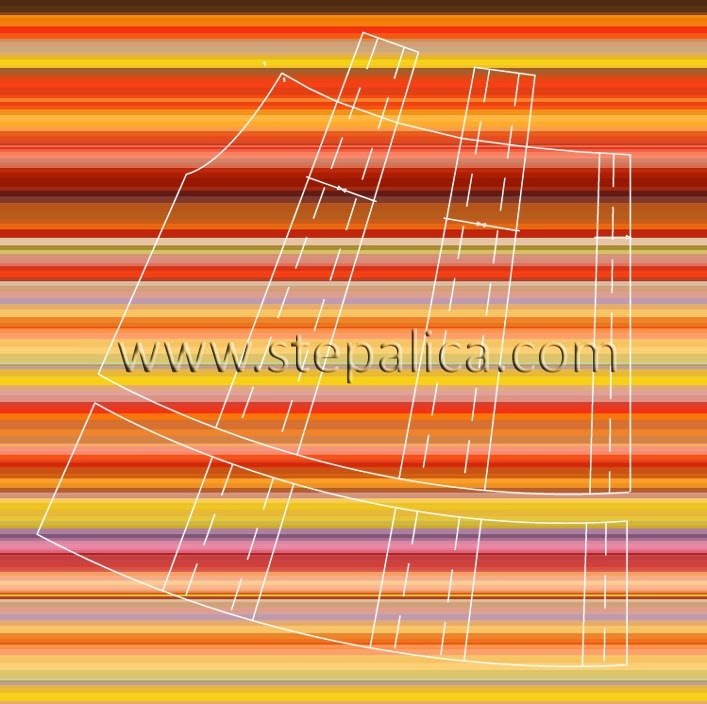 The pattern is not suitable for striped or plaid fabrics. 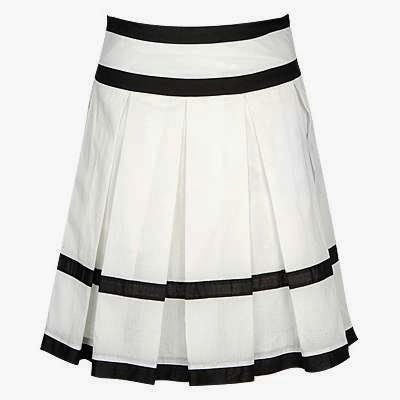 You see, the hemline of the skirt has a curved shape and the pleats are laid on an angle, meaning that the pleats would "break" and shift all the horizontal and vertical stripes of the fabric, and the skirt would not have a smooth flow of the pattern. Of course, if you like this effect, discard my advice and follow your own style preferences. 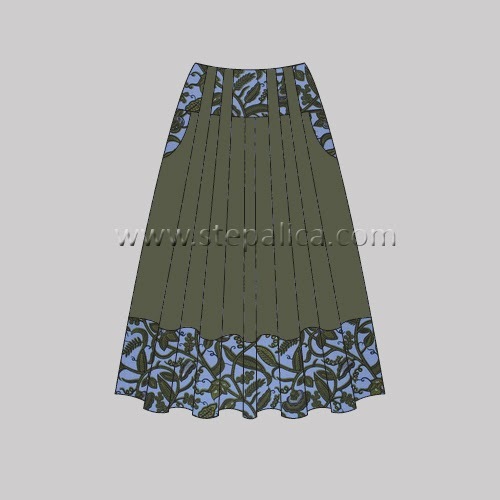 Zlata skirt pattern can be styled in various ways. You can combine fabrics in contrasting colors and prints, and here are some of the suggestions that might inspire you. Combine plain and printed fabrics. 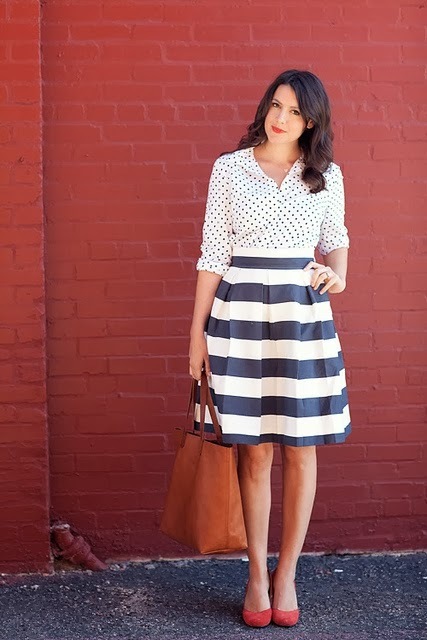 With a slight pattern alteration you can get this nautical skirt. Or you can make an ombre skirt, by using fabrics in a palette of different shades of the same color. 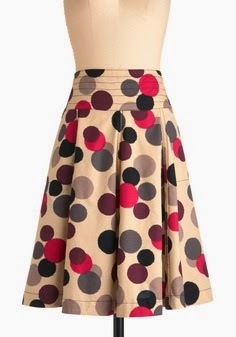 Also you can put all your fabric remnants to a good use by making a colorful skirt with this pattern variation. The remnants should be at least 1.4 m wide and 0.5 m long. Along with these suggestions, you can trim your skirt using the piping, sew on ribbons, by making a tie belt in a matching or contrasting color, etc. Along with the skirt, you can make a tulle underskirt that can be a bit longer than the over skirt and with rich voluminous ruffles that would give the skirt some additional volume. The styling options are endless! And for the very end, a giveaway! I have a nice surprise for you. 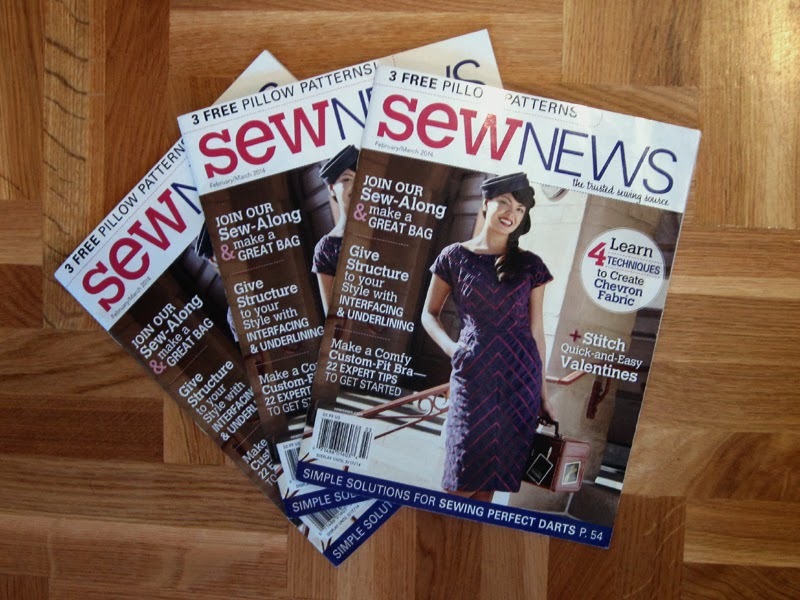 You see, few days ago I received a parcel from Sew News where instead of a usual copy I found four copies of the magazine! I guess I got one of them for each of my garments that were featured in this issue - two dresses, a blouse and a jacket. I really don't need more than one copy of the magazine, so I'll give away the remaining three. Post a comment to this post to apply for the magazine, and I'll announce the winners next Monday, on March the 10th. Throw my name in that hat, Ana! Ideje za suknje su fantasticne. Mogla bih da sasijem jos jednu za sebe! sa nestrpljenjem ocekujem nastavak tutoriala za ovu suknju i mnogo se radujem sto cu je "siti u drustvu". I am excited to see more variety of your skirt, I hope that means you get to sell more of the pattern even quicker. And thank you for the chance to win a copy of that magazine, Please include my name in the draw.